There’s only 201 days left until the return of The X-Files on Fox, and it doesn’t look like Mulder or Scully missed a beat. Though the footage from the new series is short, boy does it already start to thrill. 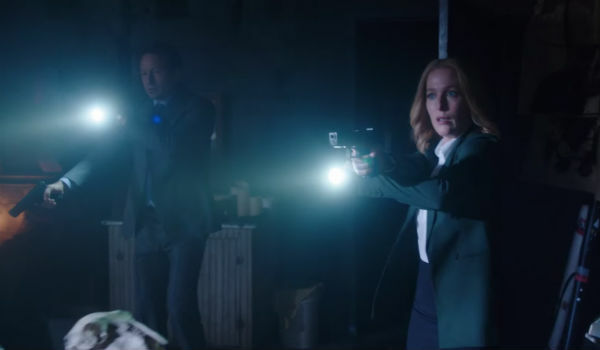 It puts Agent Fox Mulder and Dana Scully back in their familiar positions—charging through a door into a dark room with flashlights in hand. The two are barely visible, and it’s only by Gillian Anderson’s hairstyle that you can tell we aren’t in the 90s anymore. I believe that what we're looking for is in the X-Files. I'm more certain than ever that the truth is in there. It’s one of the most fitting lines of the series, with the perfect answer from Scully, telling Mulder she’s heard the truth, but now she wants the answers. Could this voiceover be relevant to the new continuation? Is there a specific truth that the dynamic duo are out to find? We’ve previously gotten a few spoiler worthy teases of story line. There has been word that the tenth season would revisit an earlier episode from Season 4, which could be a very specific answer Mulder and Scully are trying to answer. There’s also been a few details released teasing the involvement of some extra terrestrials, and as the story goes, Mulder is out to find the truth about the beyond. While Duchovny, Anderson, and a few other returning players are currently filming for the upcoming six-episode event, we await patiently for the first episode to premiere on Sunday, January 24, 2016. Until then, we’ve got 201 days of The X-Files on Fox where you can catch up on the entire series, one a day, every day, up until the Season 10 premiere.